Sometimes I’m guilty of over thinking things. We all do it, really. Each of us comes at a problem from our own unique perspective. We ‘see’ with eyes that are influenced by past experience, opinion and conjecture. We seek out solutions that satisfy our own inner narrative. I was watching the Pens beat the Blues and had the thought, “What if Crosby and Malkin hadn’t ended up on the same team?” Did each of their careers benefit by being intertwined or was something sacrificed? Was it their destiny to spend their most productive years together or some cruel twist of fate that set in motion a struggle for individual time in the sun? In Chinese philosophy, Yin and Yang describes how apparently opposite or contrary forces are actually complementary in the natural world. The properties of the Yin are passive, recessive, dark and soft while the properties of the Yang are active, creative, bright and hard. These dualities have long been associated with feminine and masculine energies when, in reality, they are interconnected and interdependent and give rise to each other. Yin and yang can be thought of as complementary (rather than opposing) forces that interact to form a dynamic system in which the whole is greater than the assembled parts. Everything has both Yin and Yang aspects, (for instance shadow cannot exist without light). The Yin Yang symbol itself shows a balance between two opposites with a little bit of the opposing force in each. Just like water seeks it’s own level, so does Yang find balance in it’s own Yin. A supreme example of Yin and Yang in hockey was Rob Brown and Mario Lemieux. It was Robbie Brown who was arguably Le Magnifique’s best line mate. Brown scored 24 goals as a rookie in 1987-88 and then exploded for 115 points the next year as the full time yin of Lemieux. Brownie understood absolutely everything 66 wanted to do. Only player ever who was truly like that. It a classic example of a yang finding it’s yin. Don’t think of the Yin as submissive, in many ways they are as dominate as the Yang. They know what the Yang needs and go to great lengths to satisfy that. When we refer to Crosby and Malkin as the two-headed monster, are we really seeing them for what they are or what we wish they would be? We wish they would be these two complimentary super forces who each possess intelligence, passing skill and unparalleled scoring ability. We imagine a perfect balance (a Yin Yang, if you will) of all that is good about each of them. What we actually get is a whole lot of Yang and hardly any Yin. Crosby is a Yang who casts a big shadow. So bright is his light that, even from the bench or the distance of injury, it shines on the ice. Crosby doesn't need Malkin in order to be great any more than Malkin needs Crosby in order to achieve elite status. When Crosby was out for extended periods, Malkin elevated his game. No longer was he incidentally shadowed by the brilliant Yang of Sidney Crosby, he was free to fully assume his own role of a Yang who’s bright light cast shadows from which emerged the Yin. Look at Geno from 2011-12 season. Sidney Crosby played just 22 games after his comeback from a concussion. Malkin took home the Hart, Ross and Lindsay awards that season. He had a career-high 50 goals and 59 assists while carrying the Penguins during the extended absence of Crosby. Malkin was the NHL's only 100-point scorer that season and the first scoring champion in a decade to win a second title despite being almost every opponent's top defensive target whenever they faced the Penguins. Would Malkin have risen to higher more sustained levels of greatness if he wasn't relegated to being the best second line center? We'll never know. 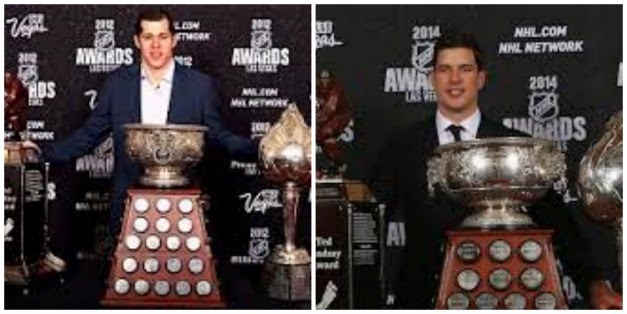 Crosby, on the other hand, has won the trophy trifecta twice. The first time during Malkin's Calder- winning rookie season and the second just this past season. Separate, Crosby and Malkin are undeniable superstars. Together, it sometimes feels like one Yang trying to yield to another. There are times when it works and times when it's awkward and a waste of energy. All of this analysis leads me to some conclusions regarding the Pens recent line mix ups and changes. I say, leave Kunitz with Malkin. In fact, I like the line of Kunitz, Malkin and Comeau. Let Malkin’s large presence create places for Kunitz to do the dirty work and allow for Comeau to be in the right place at the right time. 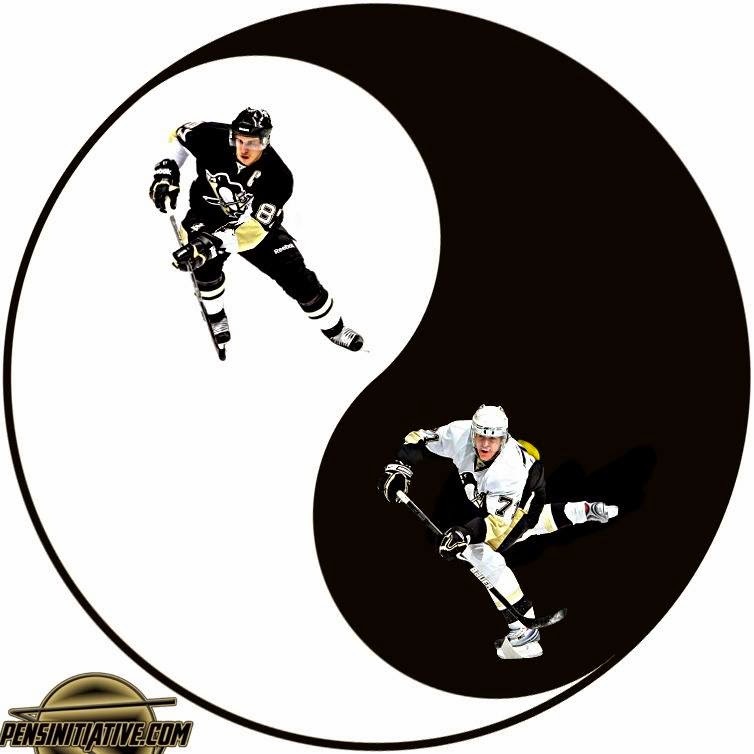 Just like each half of the classic Yin Yang contains a small amount of it’s opposite, so does the line of Perron Crosby and Hornqvist. 39 and 72, while being the yin of that line, each bring a very capable yang element that compliments the style of Crosby. He proceeded to do just that and posted 2 goals and 4 points in the back to back wins. Against the Panthers, he scored what would be the GWG when he stole a turnover in the neutral zone, skated hard to the net and launched a hard backhand shot through the pads of Al Montoya. In the third he roofed a sick one. Crosby played his game and skated hard. He left the weekend with 3 points. Malkin emerged as a more dominate Yang. Crosby, while showing Yang tendencies let his inner Yin shine. It was literally a win win for the Pens.